I have one last holiday Chex Mix to share with you, and this one is probably my second favorite after the amazing caramel corn chex mix. 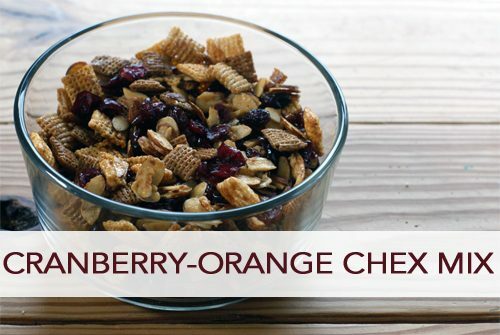 Combine cranberry and orange flavors for a tart yet sweet trail mix that’s perfect for the holidays in both flavor and color! In large bowl, combine cereal and almonds. Add butter to a 9×13 pan and put in oven to melt. Once melted, stir in sugar and orange juice concentrate until well mixed. Add cereal mixture, stirring until evenly coated. Continue baking for one hour, stirring regularly. Remove from oven and immediately add dried cranberries. Let cool. Store in an airtight container in the pantry.